7/60 Les Winan An enthralling film. Viggo Mortensen is absolutely outstanding. Cronenberg is forgiven for appearing in Jason X. 118/166 David Mumpower The most over-hyped, underwhelming movie of 2005. William Hurt offers the only engaging performance, and it lasts all of seven minutes. Theatrical adaptations of graphic novels are all the rage these days, with this project being the latest one. A-list actors line up to play parts in the films, and A History of Violence is no exception. 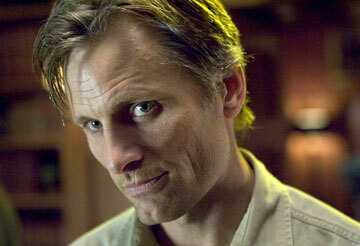 The returning king himself, Viggo Mortensen, is cast in the lead role. The director helming the project is not the sort of name you would expect to hear running a comic book adaptation, though. Creepy Canadian director David Cronenberg is in charge of this production. Why would the man responsible for such uncomfortably odd films as Dead Ringers, Naked Lunch and Crash want to handle a graphic novel-based movie? The answer is that this is not your run-on-the-mill spandex-clad superhero comic. As written by creators John Wagner and Vince Locke, A History of Violence is a character-driven tale of redemption. The story involves the owner of a diner, a well-liked, law-abiding family man. When he becomes embroiled in a robbery, the man foils the felons but in the process kills one of their rank. The businessman is made out to be a vigilante hero by the national press. In the process, unwelcome attention is brought upon him and his family. It seems that a group of thugs think he looks like an old companion of theirs who disappeared after a prior botched deal. They want revenge and now they know where he lives. See the latest developments for this project on the A History of Violence Movie News page.